A few months ago I did a “Music Milestone” piece for The Eagles “Their Greatest Hits: 1971-1975” album and while it was not the typical type of milestone item that I would normally reflect on, the album was of a very special nature to me and their founding guitarist Glen Frey had just passed away the previous month. It seemed “right” based on the timing to me and that brings me to this latest Music Milestone which raises a glass to the fact that David Bowie’s “ChangesOneBowie” Greatest Hits LP is officially forty years old today. The world lost the great David Bowie very early in 2016 and with his loss still resonating profoundly in a lot of us, I wanted to add this album anniversary to our narratives. This album would be Bowie’s first ever hits collection and it spanned about nine of his albums offering up tracks from his earliest recordings in 1969 up until 1976. I’ve left the names of the actual albums noted on the individual tracks for better reference if you were curious. I’ve owned this album for many, many years now but don’t think that I purchased it during its actual release year since I was not yet at the album buying age. That was coming soon enough based on my vintage but I was not there yet. I knew all of the tunes of course since I would listen to my parent’s stereo and focus on the Classic Rock stations of the day. WNEW FM and WPLJ FM were among my favorites back in the day. You would hear no less than three or four Bowie tracks across the regular rotation and of course these songs are resident on this first compilation. Let’s take a look at the individual tracks on the release and then we can talk about them a little more afterward. This inclusion to our “Milestones” might surprise you a little bit because not only is it an album by The Eagles, which is not a band that I normally speak of here, but it’s also a greatest hits compilation release. With the passing of the bands founding guitarist Glenn Frey last month I think that it’s great to raise a glass of whatever in the honor of this great compilation. On this day in music history some forty years ago, the music buying world saw copies of “Their Greatest Hits (1971-1975) by The Eagles on the shelves. The album came care of Asylum Records and the text below comes from the albums official Wiki entry to quickly fill you all in on this one. “Their Greatest Hits (1971–1975) comprises nine singles released between 1972 and 1975, plus the album track “Desperado.” All of these singles except “Tequila Sunrise” charted in the top 40, with five in the top ten, and “One of These Nights” and “Best of My Love” both topping the singles chart. With such airplay success in the span of a little over four years, the band became a formidable presence on American commercial radio in the 1970s, and Their Greatest Hits (1971–1975) debuted at number four on the Billboard 200 album chart upon its release and later reached number one”. 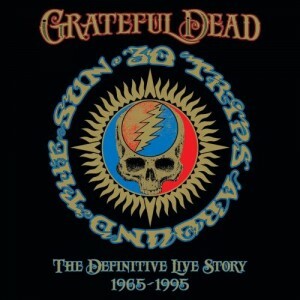 Amazon.com says “30 Trips Around The Sun: The Definitive Live Story features one unreleased live song from each year of the band’s career plus one special re-released track from the band’s earliest recordings, under the name The Emergency Crew. Every year from 1965 1995 is represented. Also featured is an essay by Dead aficionado Jesse Jarnow dissecting every track in the collection. “. It comes care of Rhino Records. It’s been far too long since the Metal world has had new music from the great Savatage and their last recorded work together was on “Poets and Madmen” which hit us hard back in 2001 care of Nuclear Blast Records. Since that time, Savatage has been on a bit of a lengthy hiatus while numerous members focused their creative energies on the holiday touring juggernaut known as the Trans-Siberian Orchestra while others continued on into projects of their own. Now in celebration of the bands return to the live stage for the Wacken Open Air Festival, a rather sound compilation of some of the bands classics has been issued and for the foreseeable future this is as close to “new” as we shall get from the legendary band. My notes on the release come from my relatively long association with their material (since 1988 if memory serves me correctly) and a deep knowledge of their back catalog. I didn’t have a copy of my own and was listening to a digital stream of it online. As a collection, this serves up well as a grouping of very necessary tracks for the listeners who might not be all that up on the bands historic game. Let’s consider this to be “Savatage Primer” since its all expected numbers as opposed to any sort of deep tracks. Perhaps if this was a double CD edition but alas this is only a single disc.